Backhills Your The Man was BOB & BIG1. 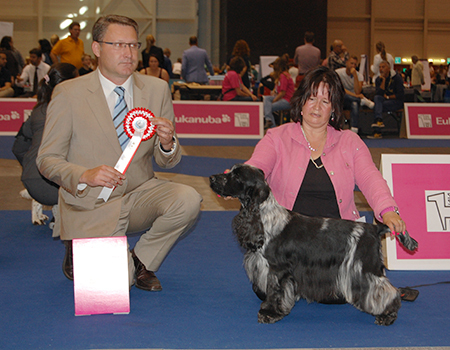 The breed was judged by Mr Rainer Vuorinen and group by Mrs Lena Danker. Backhills Your The Man CAC, Cacib, BOB & EUW-13 !!! The breed judge was Mr Damir Skok from Croatia. Shavian Hey Queen Of Sin passed spaniels working ability test !! Backhills Your The Man BOB. Say Presto Of Black Mirage CAC -> FI CH !!! The breed judge was Mr Zlatko Kraljic. Backhills Your The Man Cacib, BOB. The breed judge was Nikola Smolic. Backhills Your The Man Cacib, BOB. The breed judge was Laurent Heinesche. Backhills Your The Man BOB, BIG4. Shavian Hey Look This Way passed spaniels working ability test ! !